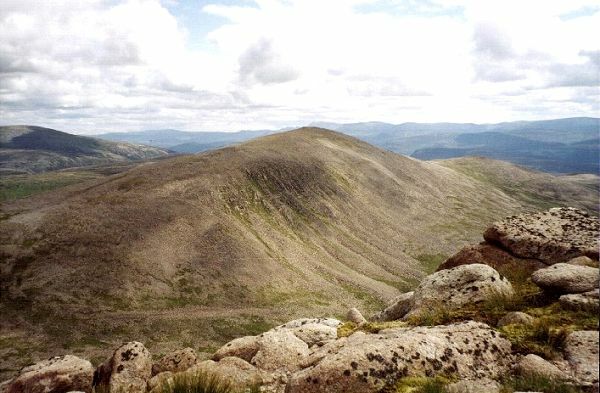 Derry Cairngorm is a 6km long mountain forming the W slopes of Glen Derry. 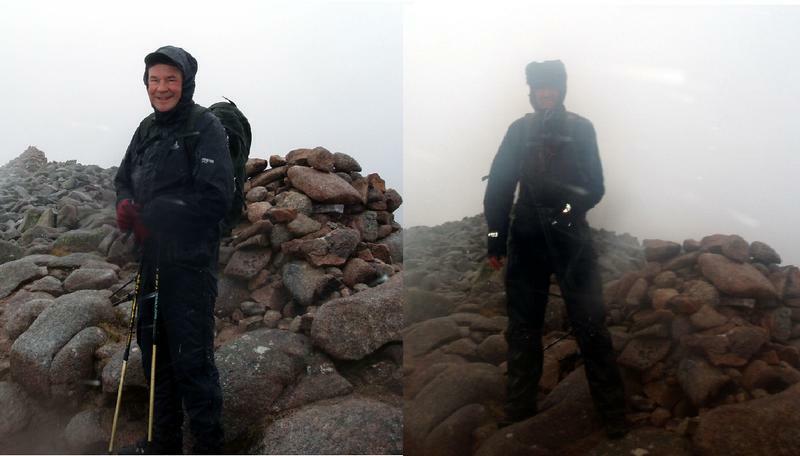 The summit, which is an elongated cone lying NW to SE lies towards the N end of the mountain between Coire Sputan Dearg (of Ben MacDui) to the W and and Coire Lochain Uaine to the E.
The E slopes into Glen Derry are generally craggy and steep and should be avoided whereas the W slopes generally have more moderate inclines and fewer rocky outcrops. The summit cone is composed of boulders, the upper slopes are of short grass and the lower slopes of grass and heather. 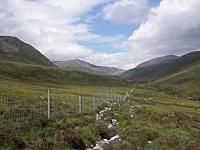 The normal access routes are from Glen Luibeg to the S or from Loch Etchachan to the NW. 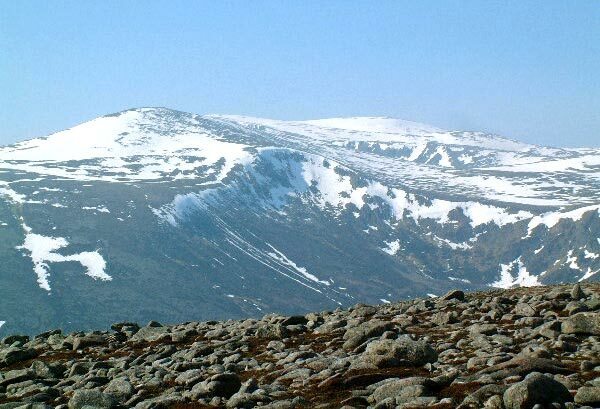 Derry Cairngorm with Ben Macdui behind and to the right seen from Beinn Bhreac. Derry Cairngorm viewed from eastern slopes of Ben Macdui leadiing down towards Loch Etchacan. Lochnagar visible in far distance just above summit of Derry Cairngorm. Beinn A'Bhuird visible on far left. 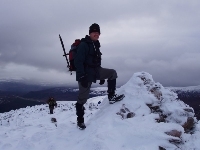 The summary information of one or more ascent routes that include Derry Cairngorm. Roy and John in a gale. 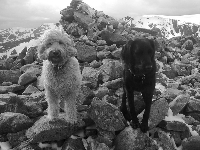 Post a few words about Derry Cairngorm or read what others have had to say. Superb path all the way from the footbridge at Derry Lodge, leads all the way up to Carn Crom, the path splits here, 1 goes along the east side of Carn Crom, the other goes up and over the top of Carn Crom, the short exposed section on bare granite is on the path that goes along the east side of Carn Crom so take the path that goes up and over Carn Crom if you want to miss the exposed bit. Path then is quite clear all the way up to the bouldery section just below the summit. 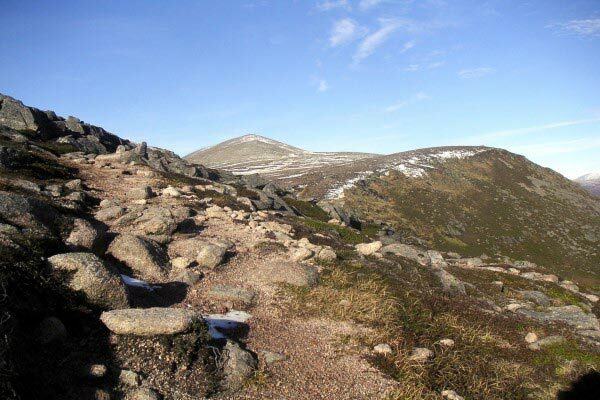 There is a rebuilt path from Derry Lodge to beyond Carn Crom. Continue straight on at the footbridge and over stiles at two deer fences. At the first crags (600 metres) stop to admire the work which has gone into making the path. 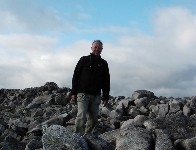 The top of Carn Crom is by-passed on the east; there is a very short exposed section here on bare granite. The terrain on the whole summit area is bouldery.